Here’s a guest post from Nicole. Her “sometimes-updated” (her words, not mine!) blog is It’s Loverly. Thanks, Nicole! For those of us who have called the Capital District home for most of our lives, Thacher Park is one of those places we return to again and again. Or at least that’s how it’s been for me. There are photos of my sister and I posed on Thacher boulders at 2 and 5 years old, photos of my family at the binoculars on the overlook in late-80s attire, photos of my sister and I beneath the waterfalls with a gaggle of kids at 9 and 12. There are photos from a family reunion at one of the pavilions, during which it poured rain but no one noticed much. There are several photos of me with my high school gang on the overlook wall, laying on blankets, and gathered around Thacher’s charcoal grills. And there are self-portraits of me and my now-husband, newly engaged, perched on a Thacher picnic table just after he proposed. All my life I’ve thought about bringing my own children to Thacher, regaling them with tales of the high dive (a moment of silence for the Thacher pool, please), showing them the Indian Ladder Trail, teaching them about the geological history of the Helderbergs that all Guilderland kids grew up knowing, and pointing out Capital Region landmarks from the overlook. 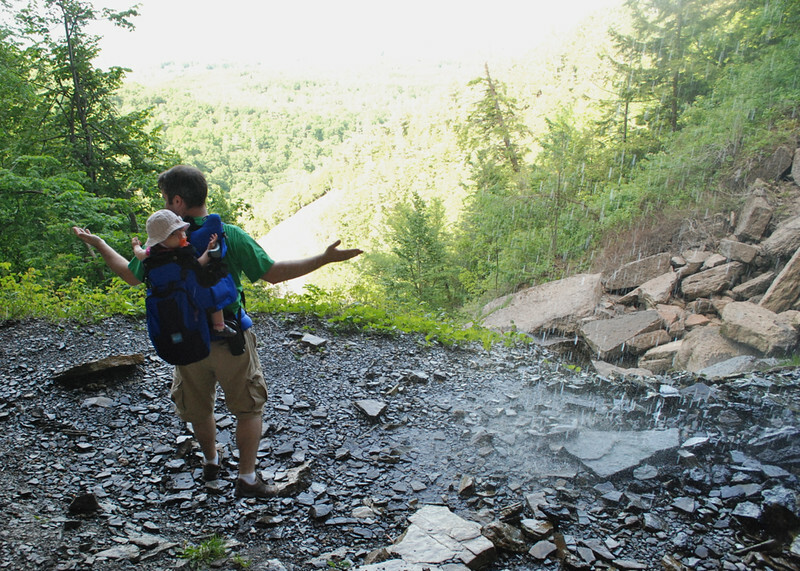 This summer, my husband and I brought our daughter to Thacher for the first time. She was 14 months old, still wobbly on her newly-walking legs, and we were happy to discover that she loved hanging out in the backpack carrier, peering out over the world from above dad’s shoulders. We walked the Indian Ladder Trail, dad and baby in front, mom in back trying not to be a worry wart about watching my husband walk down those steep steep stairs and along those steep steep cliffs with our baby on his back. My daughter studied the leaves and the trees, stretched her hands out to feel the spray from the waterfall, waved to the other hikers we passed, and touched the cool rock of the cliffs and ledges. We told her about the spot where we got engaged (a story we’ll tell her again and again), talked about trips up there in high school (stories we probably won’t tell her as she gets old enough to understand! ), and made plans to return soon for a cookout. After our hike, we weren’t ready to leave so we spread a blanket out in the grass, grabbed some toys from the car, and lounged for a bit. The little one toddled and fell in the grass, said ‘hi!’ to everyone she saw, chased a ball, climbed over us as we stretched out. We all enjoyed the early summer sun and the fresh air. The thing about Thacher is that you can return again and again and always discover something new. I know that every time we bring our daughter back she’ll be able to do new things, uncover new wonders, see the view from the overlook in different ways. Eventually we’ll take longer hikes, she’ll walk the trails on her own, we’ll check out the nature center, use the binoculars to see the valley below, take part in some of the intriguing programs (star gazing! Garlic mustard pulling! Night insects! ), find our favorite playgrounds, study the rocks for fossils, collect stones and leaves along the trail, and make new stories together. Don’t miss the overlook. There’s a snack bar there in the summer with standard snack bar fare. It’s also fun to pick up a pizza at Smitty’s (Smith’s) in Voorheesville and enjoy a slice while sitting on the wall. The Indian Ladder trail is spectacular- a short hike below steep cliffs, under waterfalls, and beautiful vistas. However, it is heavily used and I’ve witnessed plenty of unwise behavior on the trail (please, wear good footwear. Bad things come from wearing $1 flip flops on slick trails). 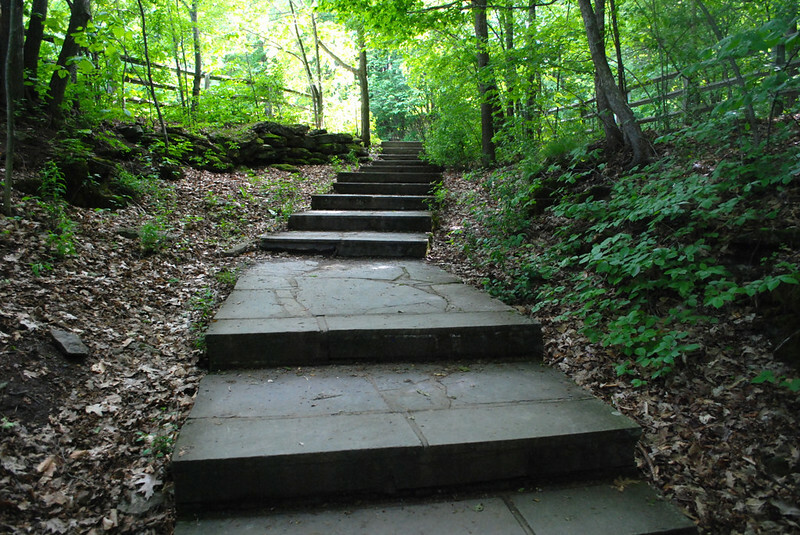 The Indian Ladder trail should be a part of your visit, but don’t discount the other hikes Thacher has to offer. Most of them are on the other side of the park, so you won’t get the same views, but there are bubbling creeks and lovely Helderberg forest to see. There are numerous picnic areas, many with charcoal grills. The park also has volleyball courts, pavilions (must be reserved), playgrounds, and playfields. There’s a lot more information on the Thacher Park website as well as the Friends of Thacher and Thomspons Lake State Park website. Thacher really is a special place. I love that you have memories back to when you were a kid! We’ve been there a handful of times but have never actually hiked Indian Ladder; we’ll definitely do it next time.